This is a great fat quarter quilt, easy to construct with lots of choices for the final layout. Linda will offer you four ideas but there are so many more if you're willing to "play with the pieces". The quilt has several sizes and instructions for the pieced border. And as always, there's tricks and techniques to explore! This easy, adorable quilt is great for beginners and up. Join Eileen from Melissa and Mom Quilts for a fun day of quilting! Why use a plain brown bag when you can add "punch" to your lunch, by sewing your own? This reusable lunch bag has plenty of room for a thermos, bottle of water, sandwich, fruit, and even PUNCH, if you want! An interior mesh pocket holds an ice pack, napkins, or silverware. Makes a great gift for kids and adults alike! This three-fabric quilt is perfect for larger prints. Make a lap-sized or larger (all the way up to King) with this easy pattern and a great teacher. Come learn a twist on this traditional Bargello-style quilt. Using ombre fabric for depth and stunning color, this beautiful quilt is very doable with fabulous results. 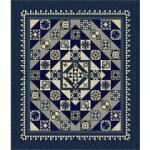 Use fabrics of your choice to make your own version of this stunning quilt. The stained glass effect beautifully frames batiks, modern prints, solids, and reproductions alike.